The promotional pamphlet you see above is included in the CD booklet from the album Kamuizm (Kamui Musou). 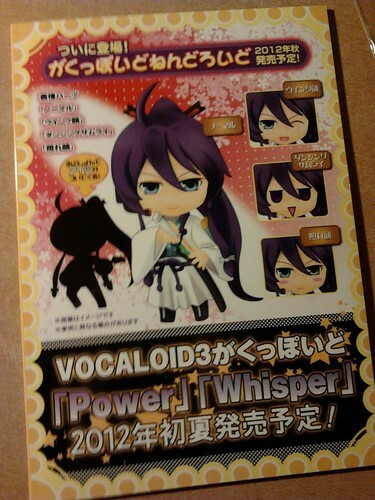 Apparently, Nendoroid Kamui Gakupo will bring along four expressions (including the default one). Meanwhile, it seems that Vocaloid Lily will also join her other Vocaloid buddies in Nendoroid realm soon, courtesy of anim.o.v.e‘s news post. This entry was posted in News and tagged animove, gackt, gakupo, kamui gakupo, lily, nendoroid, vocaloid. yehey lily! good smile co did recieve my letter wooo!!! !